Snowflakes filtered through gaps in the evergreen canopy, floating through the dark woods to settle on her wool hat. The forest was quiet — the special type of quiet that exists only during a snowstorm. She walked, leaving boot prints in the frozen, white carpeted ground. And in minutes, the prints were gone, buried by the fast-falling snow. The blue rectangles painted on the trees to mark the trail were easy to spot in the otherwise grey and white world. Young balsam fir trees lined the trail, overshadowed by their towering ancestors. Cloaked in white, the short trees looked like tiny tents, a crowded encampment for the creatures of the forest — the squirrels, mice and snowshoe hares. At Branch Lake, the trail turned to run along the frozen shore, where the snowfall formed a curtain of white, creating the illusion that the lake stretched on forever. There at the edge of the ice, she dusted off a boulder and sat. And as the icy cold of the earth slowly seeped through the seat of her insulated pants, she felt grounded, as if she herself might turn to granite — or perhaps melt into the beautiful landscape, like the snowflakes melting on her cheeks. This 1,200-acre public forest features a network of hiking trails that altogether totals 2.6 miles, connected by a wide tote road that is about 0.75-mile long and is closed to vehicles, making for an ideal easy snowshoe location. Though still evolving, the trail network currently includes Pine, Brookside and Marsh trails, which travel through a mixed forest with plenty of large, old trees, and impressive glacial erratics. And there’s also the Lake Loop Trail, which is a little less than a mile long and leads to several outlooks along the shore of Branch Lake. Dogs are permitted on the trails if on a leash no more than eight feet in length. For more information, call the City of Ellsworth at 207-667-2563. Directions: From the corner of Main Street and Route 1A in downtown Ellsworth, drive approximately 6.5 miles north on Route 1A, then turn left onto a gravel access road marked with a large brown sign that reads “Branch Lake Public Forest.” Drive about 1 mile to a small parking area to the left of a gate barring off the rest of the road to vehicle traffic. This road leads to all of the trails in the public forest. 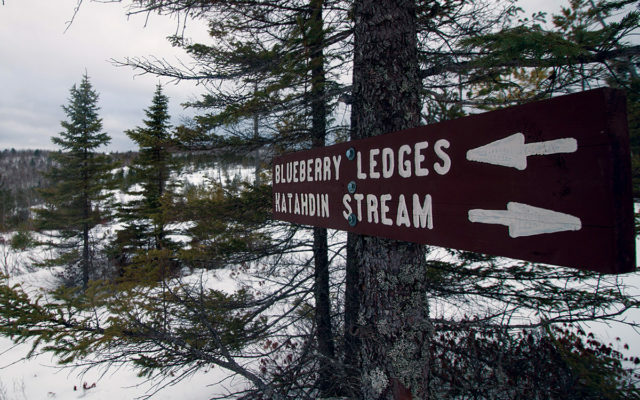 A popular day hike and snowshoe route in Baxter State Park, Blueberry Ledges Trail is easily accessible from the famous Golden Road, which is open to vehicle traffic year round. Spurring off the Appalachian Trail not far from Abol Bridge, the wide Blueberry Ledges Trail travels gradually uphill through beautiful forest of young white birch and poplar trees to Blueberry Ledges, an open stream valley that features smooth granite ledges. At the ledges, a side trail leads to the left to where Katahdin Stream tumbles over the rock, forming little waterfalls. Hiking to the trail’s highlight natural feature, Blueberry Ledges, from the trailhead on the Golden Road, is a 2.1-mile hike, making for an out-and-back hike of 4.2 miles. This section of the trail is fairly wide with a gradual incline. However, the trail continues past the ledges for 3 miles, ending at Park Tote Road just south of Katahdin Stream Campground. This section of the trail climbs a steep hill and is narrower and more challenging, so feel free to explore this portion of the hike if you’re feeling ambitious. Directions: In downtown Millinocket, where Route 157 intersects with Katahdin Avenue, head north on Katahdin Avenue, following signs directing to Baxter State Park. Drive 0.2 mile, then veer left onto Bates Street, continuing toward Baxter State Park. Drive 8.4 miles, then turn left onto a short gravel road that leads to the Golden Road, where you’ll turn right to continue north. Drive 9.9 miles on the Golden Road, being careful to stay out of the way of logging trucks and moose. Turn left to park in the large parking area just before Abol Bridge. Rising 955 feet above sea level, Spruce Mountain features a 2.5-mile hiking trail that leads through a mixed forest to three outlooks on the mountain’s ridge. The viewpoints provide spectacular views of Ragged Mountain, Mirror Lake, and the ocean beyond. Spanning from Mount Pleasant Street and Route 17 in Rockport, the Spruce Mountain Trail is a part of the much longer Georges Highland Path, a 50-mile network of blue-blazed footpaths in Midcoast Maine built and maintained by the Georges River Land Trust. This Spruce Mountain Trail is especially good for snowshoeing because it traverses gentle slopes and is almost completely in the forest, which means the trail markers are on trees, making them easy to follow year round. On the other hand, some of the neighboring mountains in the Midcoast region feature trails that travel over bald ridges and peaks, and these trails can be difficult to follow in the winter because snow covers the trail markers, which are rock piles called cairns and painted marks on the bedrock. Dogs are permitted if kept on leash. For more information, call 207-594-5166. Directions: There are two options for hiking to the mountain’s summit. To reach the west trailhead on Route 17, start at the intersection of Route 17 and Route 90 in West Rockport and drive 1.8 miles north on Route 17; the parking area will be on your right, marked with a large wooden sign. To hike toward Spruce Mountain, cross the road and hike south on the Georges Highland Path. To reach the east trailhead on Mount Pleasant Street, start on Route 17 in Hope, turn onto Harts Mill Road and drive 0.3 mile, then turn left onto Fogler Road and drive 0.6 mile. Turn left onto onto Mount Pleasant Street and drive about 1 mile to the vehicle turnout on your left. To hike toward Spruce Mountain, hike east, passing under power lines and crossing a clearing before entering the forest.